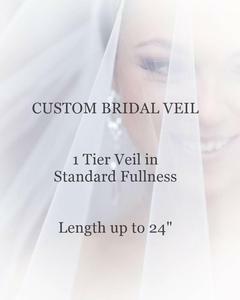 This cascading shoulder length wedding veil will add simple elegance to your wedding day. This shoulder veil features our cascading sides cut, and is gathered onto a comb. This wedding veil can be worn at any position on the head. A matching pencil edging gently defines the edge of the veil.